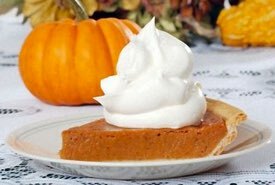 Here are unique Thanksgiving recipes for making harvest-style desserts to delight your guests and earn you well-deserved praise. Everyone will love the taste of these old fashioned desserts that are so in keeping with the autumn season. Just imagine a delicious lima bean custard, an onion souffle, a tomato and corn pudding, a recipe for fritters made with beets, and more. You will want to try these Thanksgiving desserts. They are totally delicious and are always a topic of conversation. Wash one cupful of dried lima beans, cover them with cold water and soak overnight. Drain and put them into a saucepan covered with cold water, and boil until they are soft. Rub them through a sieve, add half a pint of sugar, two teaspoonfuls of butter, three beaten eggs, half a cupful of milk, and one teaspoonful of vanilla extract. 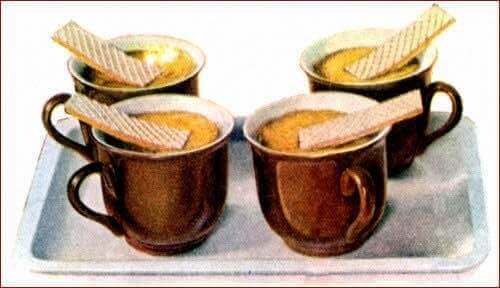 Mix and divide into custard cups, cover with buttered papers, and steam gently for half an hour. Serve hot or cold with sweet wafer cookies. Melt two tablespoonfuls of butter in a saucepan, add three large, sliced onions and one cupful of water, cover tightly and let the onions steam until tender and all the water is cooked out, then allow them to become a yellowish color. 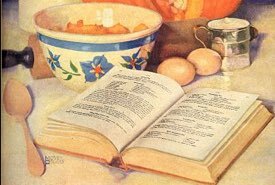 Remove from the fire, mash the onions, add one tablespoonful of flour, the yolks of three eggs and three tablespoonfuls of sugar beaten together, one tablespoonful of butter, two tablespoonfuls of cream, a quarter of a teaspoonful of salt and the whites of the eggs stiffly beaten. Divide into small, buttered baking dishes suitable for serving in, sprinkle a little sugar and chopped nuts over the top, and bake until ready. 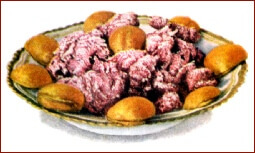 Two beets, the yolks of four eggs, three tablespoonfuls of flour, three tablespoonfuls of cream, one tablespoonful of sugar, a grate of nutmeg, and the rind of half a lemon. Boil the beets until tender, then skin them and rub them through a sieve, add the yolks well beaten, the sugar, cream, flour, nutmeg, and lemon rind. Mix well and form into neat fritters, using a little flour. Allow to stand for fifteen minutes in a cool place, then fry in smoking-hot fat or lard. Serve decorated with fresh or preserved apricots, or homemade ice cream. 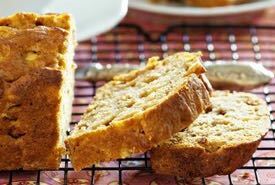 Rub two cupfuls of cooked squash into a basin, add one egg well beaten, two tablespoonfuls of melted butter, one tablespoonful of sugar, a quarter of a teaspoonful of salt, four tablespoonfuls of flour, and half a cupful of chopped English walnut meats. 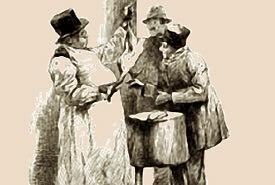 Form into neat croquettes, brush over with a beaten egg, toss in fine bread crumbs, and fry in plenty of smoking-hot fat or lard. Drain, and serve the croquettes with a sweet dessert sauce. This unique Thanksgiving recipe makes a delicious dessert that you can serve on any occasion. One cupful of cooked corn, one cupful of sliced or quartered raw tomatoes, four tablespoonfuls of butter, four tablespoonfuls of bread crumbs, one teaspoonful of sugar, and seasoning of salt and pepper to taste. Mix and pour into a buttered baking dish. Sprinkle a few bread crumbs over the top, dot with small pieces of butter, and bake for half an hour in a moderate oven. Serve hot in the dish in which the pudding was baked. To make this unique Thanksgiving recipe, first wash one cupful of lentils in several waters and soak them in water for twelve hours; then boil them until soft but not pulped. Drain and add two tablespoonfuls of melted butter, one tablespoonful of sugar, a quarter of a teaspoonful of salt, yolks of two eggs, and half a cupful of chopped nutmeats. 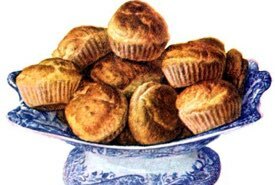 Make into small round cakes, lay on buttered tins, and bake in a hot oven for fifteen minutes. Sprinkle a few chopped nuts on top and serve hot. Line gem or muffin pans with pastry. Put one cupful of milk and two tablespoonfuls of butter into a saucepan, bring to boiling point, and carefully pour over a quarter of a pound of white breadcrumbs; add three tablespoonfuls of sugar, one tablespoonful of lemon juice, three tablespoonfuls of currants, and two beaten eggs. Lightly mix. Put a spoonful of this mixture into each gem pan and bake until done. These little tarts are so good tasting! Puzzled about old time oven temperatures and measurement units? Click the Button below for helpful conversions.